Pennsylvania is located in the EDT (Eastern Daylight Time) time zone, UTC/GMT -4. The sunrise is at 07:07 and the sunset at 18:25 for the moment of the mid-October 2018. The length of the day is 11 hours 17 minutes. The time in Greenwich, London is 5 hours ahead of Pennsylvania. The diverse state's topography affects the difference of the climates across Pennsylvania. Thus, winters there are cold and summed are hot and humid. The majority of the state, except the southeastern part of it, is located in a humid continental climate, which is characterized by the significant temperature differences. Latrobe, as well as Pittsburg, lies in a humid continental climate zone as well. Winters here are cold and quite snowy. Springs and autumns are moderately warm with the average level of sunshine. Meanwhile, summers are hot and humid and are regarded as the sunniest season of the year. 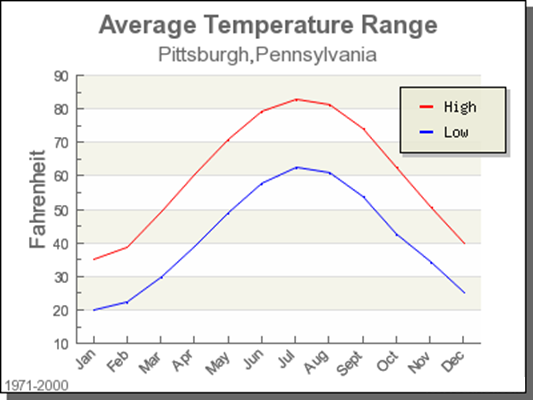 The warmest month of the year in Latrobe is July when the temperature reaches 22.6 °C or 72.6 °F. The humidity level is high these days, and the temperature might reach 32 °C or 90 °F 9.5 days a year. The coldest month of the year in Latrobe is January when the temperature reaches −2.0 °C or 28.4 °F. However, the temperature might fall below freezing for approximately 2.6 nights per year. The coldest lowest was recorded on January 19, 1994, when it reached −30 °C or −22 °F. The highest was filed on July 16, 1988, when the temperature was 39 °C or 103 °F. Due to the proximity of the region to the Appalachian Mountains, the maximum temperatures had rarely reached 38 °C or 100 °F after the last notice on July 15, 1995. May is considered the wettest month of the year, while October is regarded as the driest one. The average level of precipitation reaches 970 mm or 38.2 inches mark annually. Meanwhile, December and January are the months with the highest precipitation levels of the year. The snowfall average reaches about 105 cm or 41.4 inches per season. Notably, Pittsburg was ranked the 24th in the United States by the air pollution level. However, the state's municipality if trying to improve the situation. Therefore, by 2005 there were already 31.000 trees on every 900-mile street. The city spends about $850.000 on tree planting and maintenance each year. The water condition is of poor quality as well due to the untreated sewage into local rivers and lakes. As the sewage system was not improved after its construction in 1959, the public health concerns have arisen over the past decade. However, a $2 billion investment was proposed by the Allegheny County Sanitary Authority or ALCOSAN to upgrade the sewage system of the city. The project still needs to be approved by now.